Growth form: Small shrub. Flowering. Oct–Nov. Status: Native. Common. Also recorded: Bahrain, E Saudi Arabia, UAE. 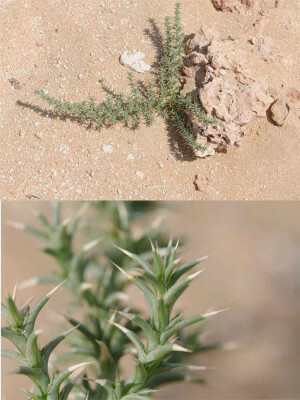 Habitat & distribution: Frequent in coastal areas and in S Qatar on deeper saline sand. Uses: Reported by Rizk & El-Ghazaly to have some degree of antimicrobial activity when ingested. Leaves are used to treat jaundice in Qatar (Ghazanfar).